Zeek Plumbing is ready to serve you! Call now to book your service appointment! When it comes to plumbing, there are many ways that you can save money and avoid unnecessary water and money loss. If you follow some simple tips, such as, reducing your daily water use, ensuring pipes and taps are working properly, you will conserve water and therefore reduce your monthly bills. Repair Leaky Faucets – A dripping tap can waste up to 15 gallons of water a day. By repairing or replacing a leaking fixture, you will stop wasting water and save money in the long run. Go With Low-Flow Showerheads – By installing a low-flow showerhead you can reduce your water consumption significantly. These showerheads use far less water. A conventional showerhead can waste up to 42 gallons of water in one 10 minute shower. Reveal and Repair Hidden Leaks – To determine if your home has any leaks, check your water meter before and after a length of time in which no water was used. If the meter has changed, then there may be a leak hidden somewhere in the home. Don’t Neglect Your Drains – It is a good idea to use strainers in the bathroom sink and shower drains to keep hair and soap out of the pipes. If you keep your drains working properly, you will avoid an annoying clog. If a drain does become clogged or is draining sluggishly, do not use harsh chemical drain cleaners. This will only damage your pipes and harm the environment. Call Zeek Plumbing and we will snake the drain safely and effectively. Check Your Toilets for Leaks and Noises – Toilets account for 30 percent of daily home usage so it is very important to ensure that your toilets are leak-free. To test a toilet for leaks, drop some food coloring into the tank. If the color seeps into the bowl after 10 or 25 minutes, the toilet has a leak. Use Discretion With the Garbage Disposal and Other Drains – Never pour hot grease down the garbage disposal or any drain. Grease can lead to a blockage, as it will solidify and, over time, may cause a clog inside the pipes. Don’t Ever Flush These Items Down the Toilet – Dental floss, hair and wipes are three items that should never go down the drain . These things, in particular, can wreak havoc with your plumbing system. Floss and hair can bond with other waste and form large clumps that block pipes. Wipes may claim to be flushable, but many times lead to clogs and backed up toilets. Fix some small repairs while they are still small. Minor problems, if not fixed, eventually may become major problems. Know how to shut off your home’s water. Locate your shut off valve and turn it clockwise in order to prevent a costly plumbing disaster. The difference between $100 and $1,000 can be knowing how to shut off your water. By following the tips above, you will keep your home in great repair and keep your money in your pocket! 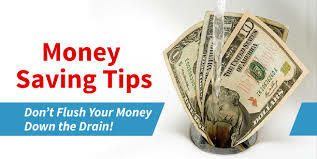 $$$ Contact Zeek Plumbing today, 866-635-0200, should you have any questions or need plumbing service. Copyright © 2018 Zeek Plumbing & Mechanical. All rights reserved.